One of my struggles over the last several years has been an appetite to do too many projects but having the constraint of a finite amount of time to do them. Between living in beautiful Colorado, switching jobs, purchasing a house, planning a wedding, learning photography, it is hard to figure out where I should spend an open block of several hours. I’ve written before how to manage my time using Gmail GTD. That’s worked well for me when it comes to managing rote to-do lists and not letting execution-level priorities drop. But not good for prioritizing, communicating, or delegating to others. But I need to prioritize! Gmail GTD won’t work for at-home projects. This January, I got my Scrum-master Certification from Mountain Goat Software. Scrum worked well with a large organization with multiple competing priorities and stakeholders to keep in the loop. But it is a lot of overhead and is team-centric. I do not have a team working on personal projects to me for me. Scrum wouldn’t work here. I think I cracked the nut. It’s Kanban! 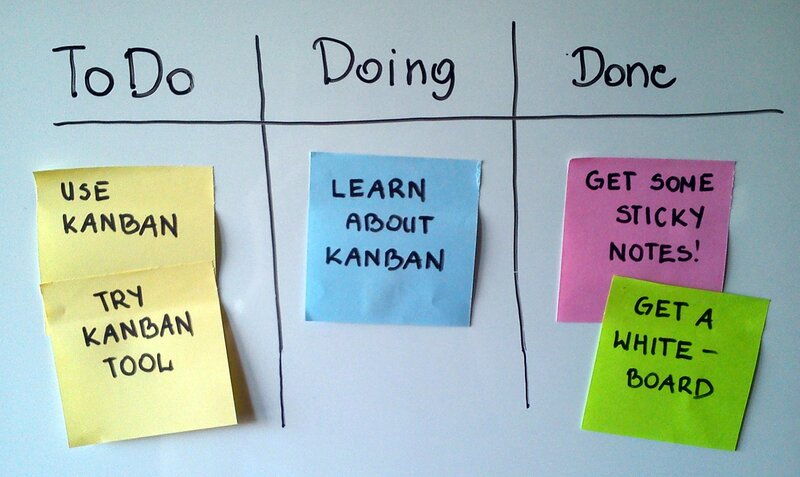 Kanban is a Japanese word for ‘visual signal’. Building a Kanban board starts with visualizing the work, By nature, Kanban is not prescriptive. After work is visualized, one can optionally add in elements of other processes (estimations, prioritizations, assignments, limits on work-in-progress, epics, bottleneck analysis, focus on flow, continuous improvement). I had been managing a kanban board for personal projects via Trello, but found that Trello was out of sight, and therefore out of mind. As someone who spends their days doing programming, I needed a place for my personal project planning that is physical, as opposed to digital, and prominently displayed in my office. 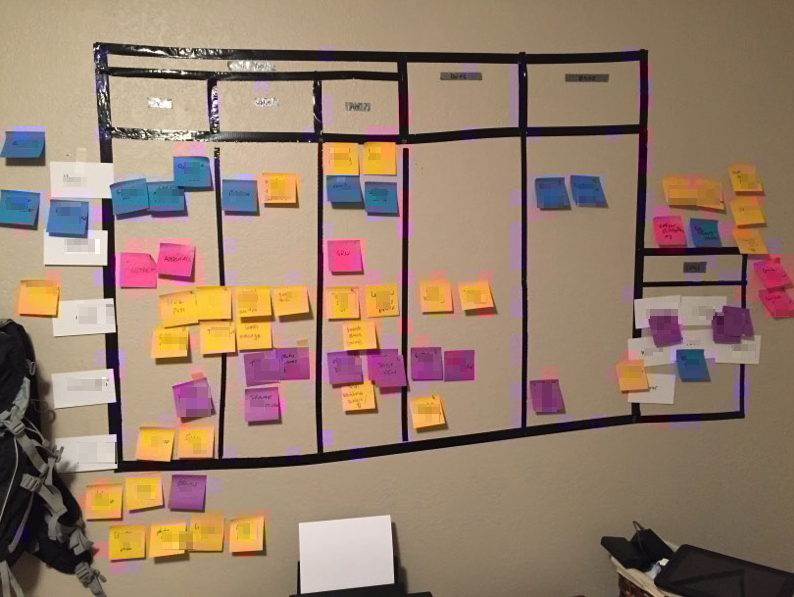 So I put a Kanban board in my home office: It’s only v1 (ie. that means made with duct tape), but it’s filled with ideas (which are now prioritized, yay!). I am happy to say that only five items are ‘in progress’. 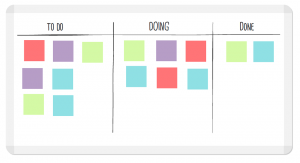 Head over to LeakKit to check out their short, 25-page, whitepaper on Kanban. 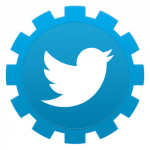 I am not affiliated with them, but it’s how I put together v1 of the Kanban board. /walks to Kanban board, moves ‘Write Blog Post’ from ‘In Progress’ to ‘Done’.